Collagen is naturally responsible for the firmness of the skin. With age and hormonal changes, the metabolism of the skin slows down, collagen production progressively diminishes and facial tissues start to sag. The L'Oréal Laboratories have created Age Perfect anti-sagging programme for mature skin to firm up the fabric of the skin. 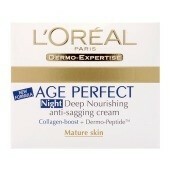 I received a free full sized pot of Age Perfect Re-Hydrating Cream from L'Oreal Paris to try and review. The pots are really classy in white glass and feel like a luxury product to hold while using during my daily regimen. The top has a metallic gold finish which contrasts beautifully with the container and the pot looks good sitting next to the sink and makes me feel pampered. My only annoyance with the lid is that it is a little stiff to close completely and then open, so I often don't close it fully, which doesn't look quite as good. The product has a light cream colour and has a thick consistency which is easy to take from the jar on the fingers for application. It feels silky and hydrating when applied around the eye area and my eyes feel instantly revitalised. It combines well with the other products which I use as part of my daily regimen and doesn't feel greasy. After using this product for approximately three weeks I have noticed that it has plumped the deeper lines I have above the outer edge of by eyebrows which are a concern of mine. This has pleased me as they can be quite deep even when I have used some reputable brands of eye cream. My eyes have felt hydrating during the time I have used this product. Moving to the more mature! I bought this when I was needing a night cream and was in a shop that had this on special so no contest really. I found it a really good thick moisturising cream that did an excellent job overnight. My skin is quite dry in winter so needs all the help it can get and this is perfect for the price. I wish L'Oreal were clearer on their animal testing policy as I do like to avoid companies that test on animals and I try to buy more eco friendly products and this has some very non eco sounding ingredients. It is a very decent price though and you can't argue with that. Everything began ok with this cream but sadly it turned to disaster quickly for me. I do not want to take away the goodness of this product but my skin simply could not take the richness of this cream. This cream has a medium consistency and is off white in colour but has a very overpowering perfume scent. This does not particularly put me off a product but I fear the fragrance is a little strong for a face cream. Yu only need a small amount per application as it is very rich and it absorbs well into the skin. It instantly moisturises and gives a radiant look to the skin but by the morning my face and t-zone were greasy and oily. There was a pleasing plumpness to my skin but the oil was terrible. Sometimes your skin needs time to adapt to new cream so I will always persevere for a decent length of time but there was no improvement in my skin’s reaction to this product. Eventually I began to break out and had to discontinue use. I noticed no visible change in my fine lines but there was an improvement on the creepiness of my neck and décolleté.